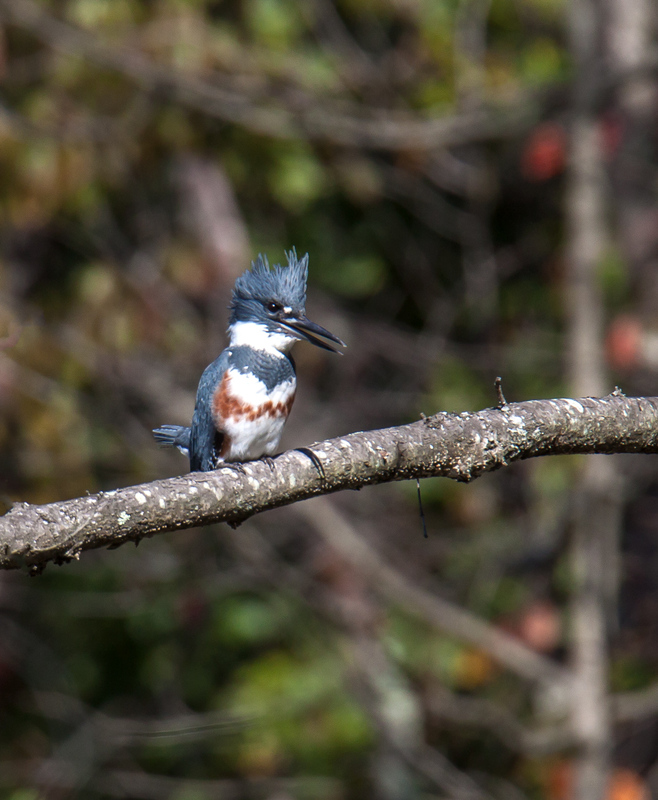 It often feels like Belted Kingfishers (Megaceryle alcyon) are taunting me. They boldly advertise their presence with a distinctive rattling call, but keep their distance or fly away quickly before I can spot them. I dream of spotting one at close range and getting some shots before it is aware of my presence. 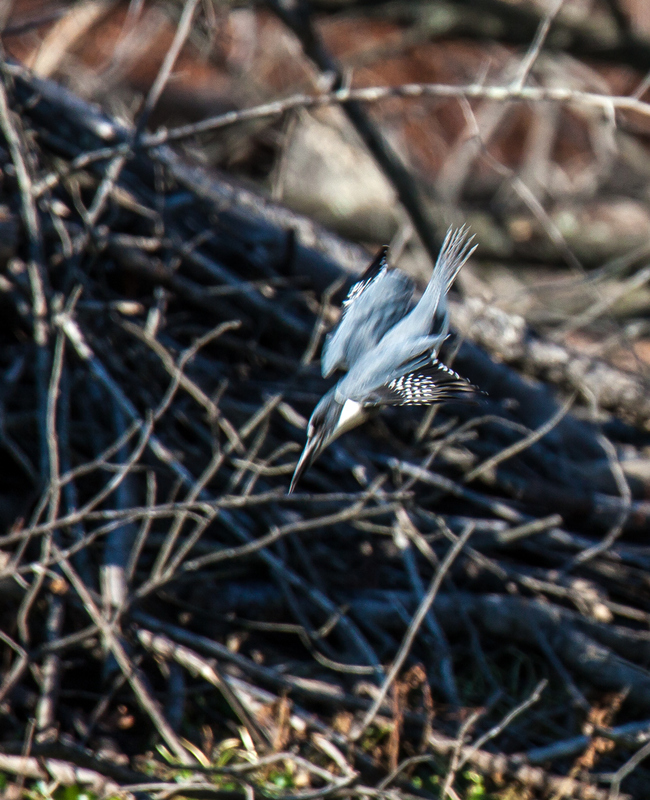 Well, my dream did not not come true this past Monday, but I did manage to get some shots of a female Belted Kingfisher in flight while exploring Occoquan Bay National Wildlife Refuge. 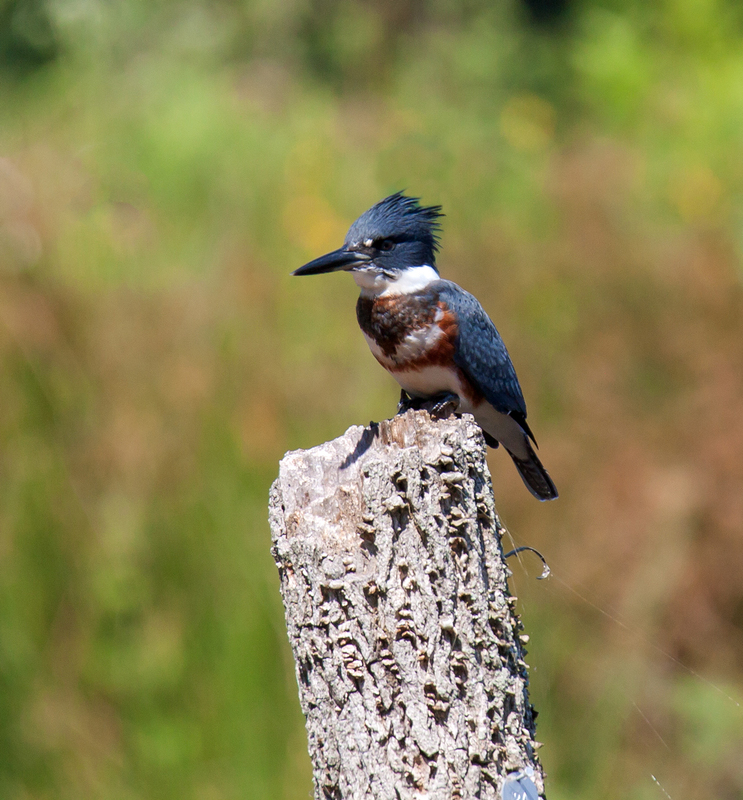 I took the shots at pretty long range as the kingfisher was moving from perch to perch in the distant trees. 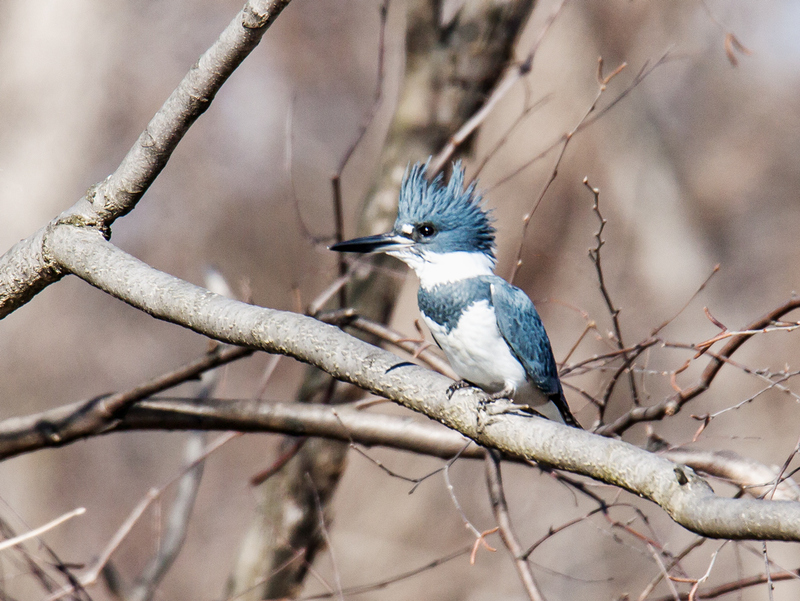 Every monarch needs a crown and this female Belted Kingfisher (Megaceryle alcyon) seemed to be wearing a leafy one yesterday at Occoquan Bay National Wildlife Refuge. 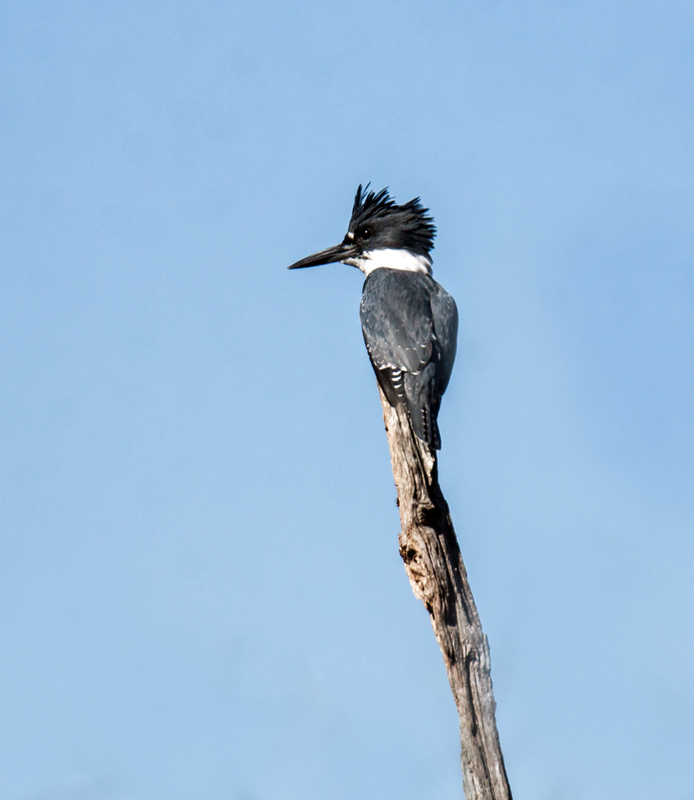 Belted Kingfishers (Megaceryle alcyon) are normally very skittish and it seems like they always choose to perch in distant trees. 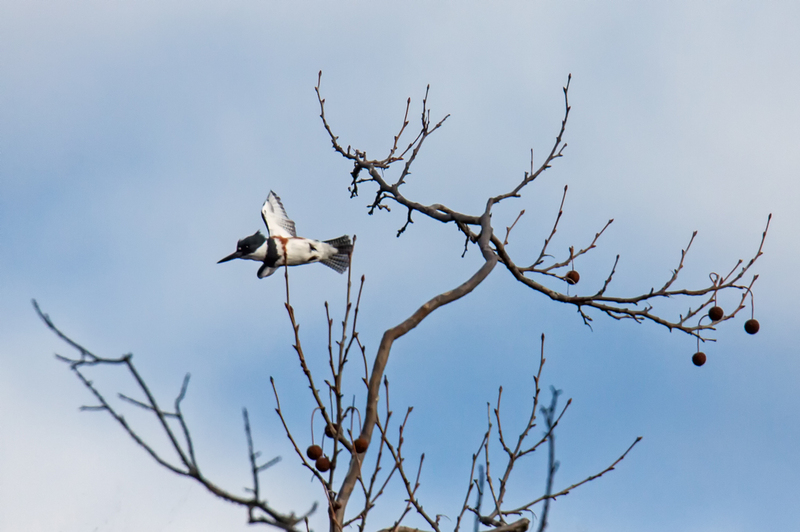 This past weekend, however, a female Belted Kingfisher flew to some trees that were a lot closer than usual and I was able to capture these shot. 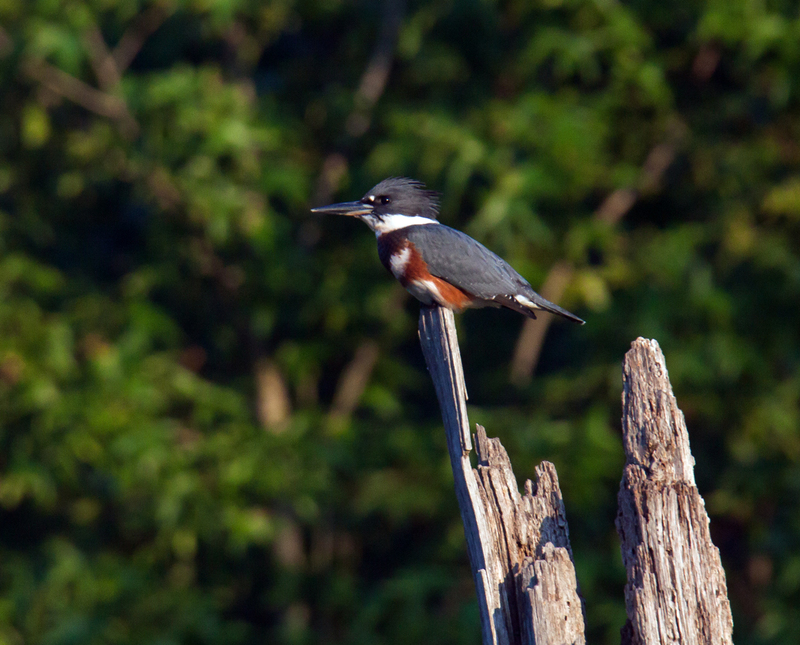 The images don’t exactly fill they frame, but they do show a lot of the cool details that make the kingfisher so special. 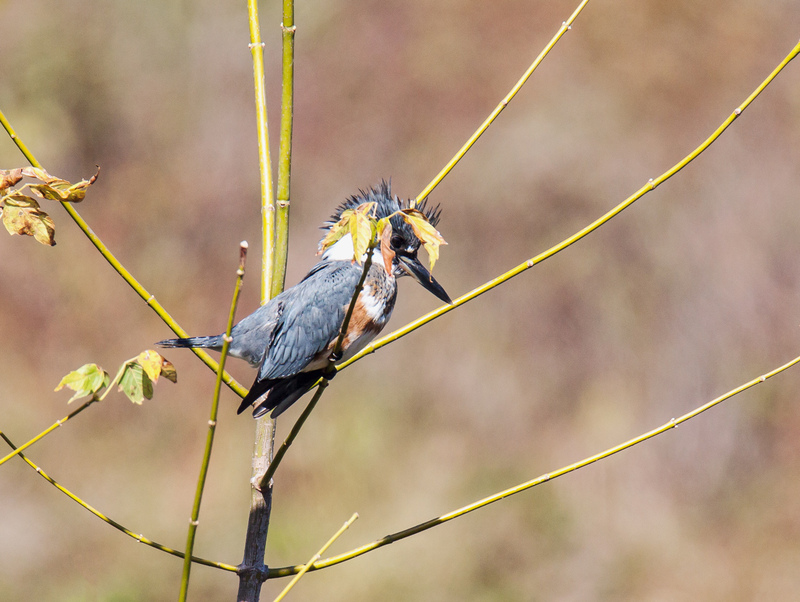 In case you are curious, it is really easy to identify the gender of Belted Kingfishers—only the females have the rust-colored stripes on the chest, one of the few cases in which a female of a bird species is more colorful than the male. 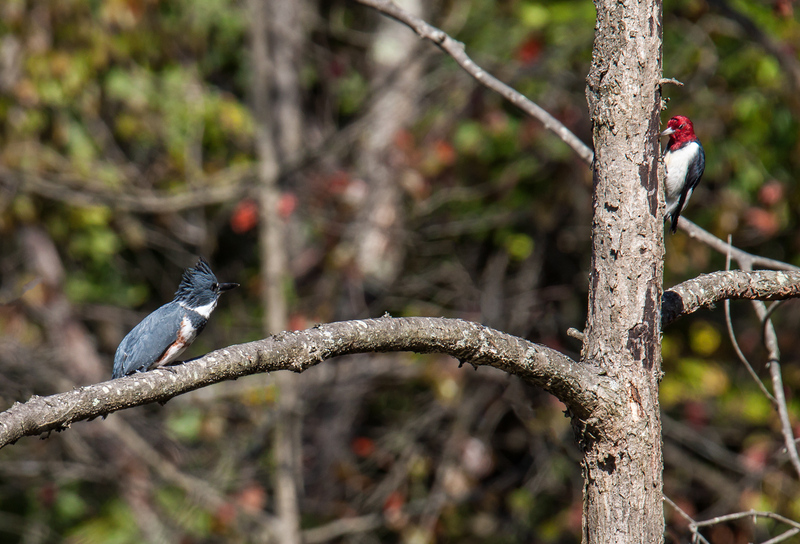 A Belted Kingfisher (Megaceryle alcyon) and a Red-headed Woodpecker (Melanerpes erythrocephalus) seemed to be eyeing each other with intense curiosity this past Friday at Huntley Meadows Park when they both chose to occupy the same tree at the same time. Redheads have a mysterious attraction, it seems, in the bird world as well as in the human world. 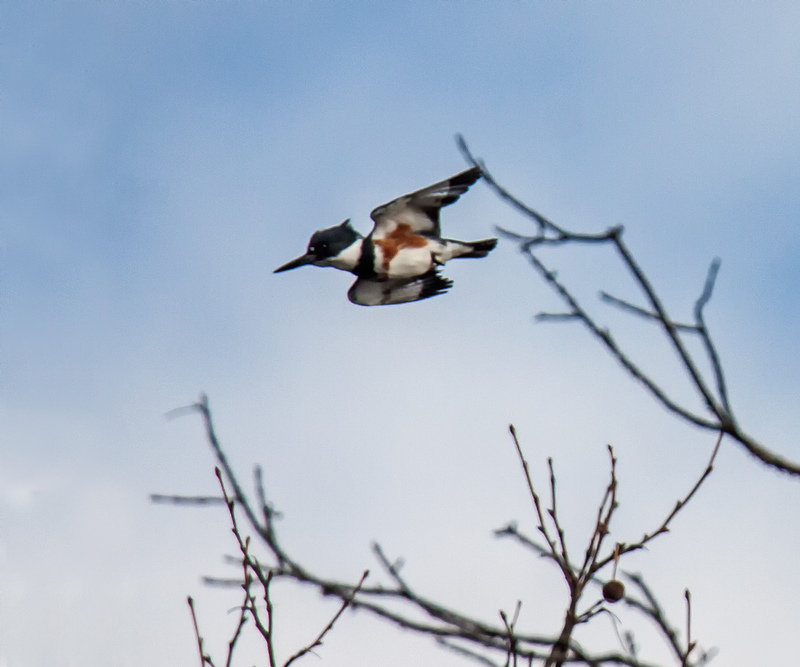 I spent a considerable amount of time one morning earlier this month at Huntley Meadows Park trying to get some shots of this skittish female Belted Kingfisher (Megaceryle alcyon). It was almost impossible to get really close, so I had to rely on my long telephoto zoom lens. 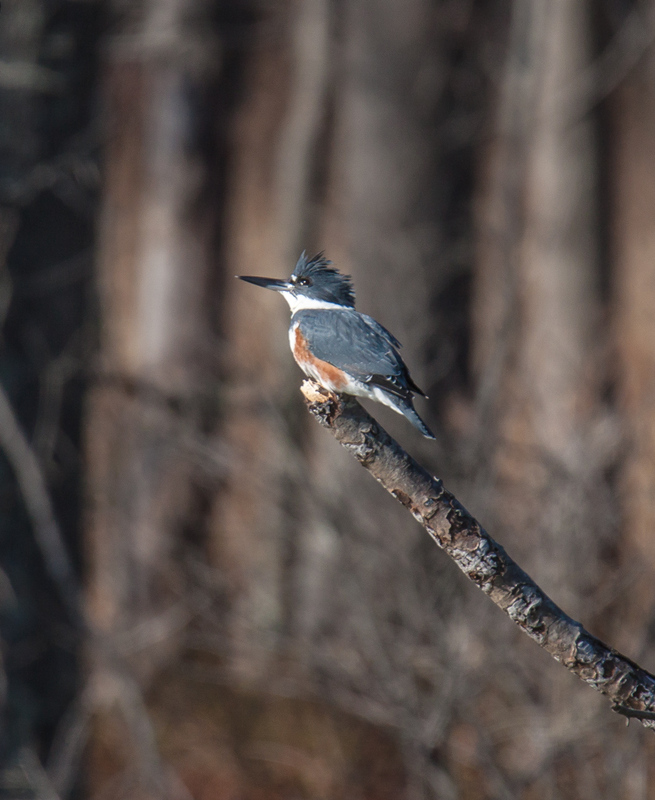 With stealth and patience I can get relatively close to some birds, but Belted Kingfishers (Megaceryle alcyon) remain elusive, skittish, and difficult to capture. 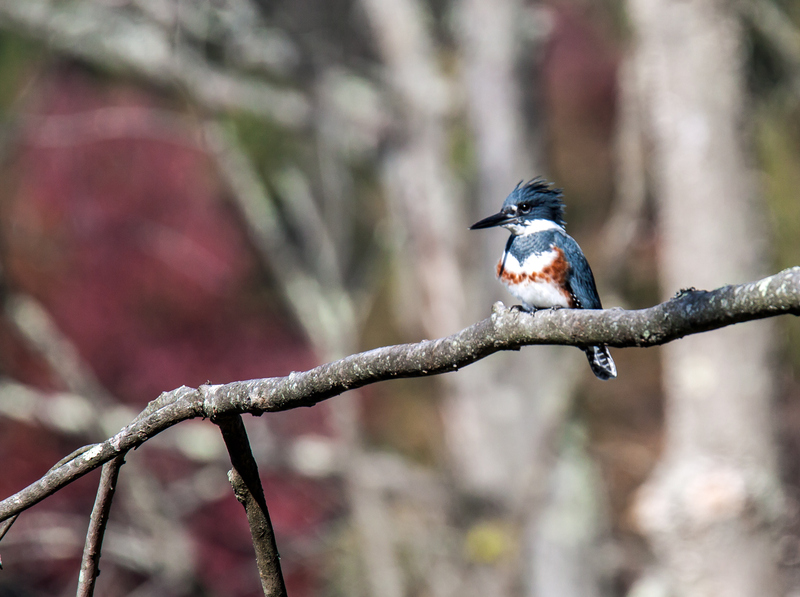 I was fortunate to get some long distance shots of a handsome male kingfisher (males have no chestnut-colored stripe on their chests) last weekend in the trees overlooking Lake Cook in Alexandria, Virginia. 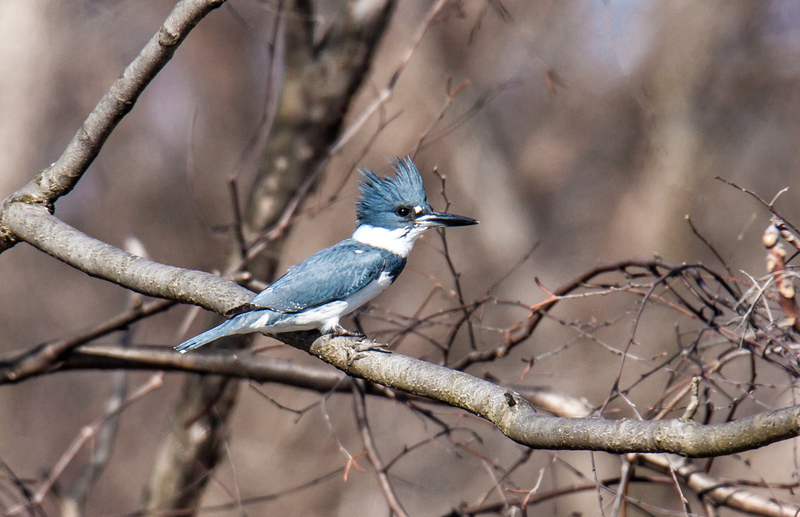 I spent a fair amount of time yesterday at Huntley Meadows Park watching a female Belted Kingfisher (Megaceryle alcyon), one of my favorite birds. She was perched on a broken-off tree a pretty good distance away and there was no way that I could get any closer, since there was water between the boardwalk on which I was standing and that tree. The kingfisher remained perched for quite some time, so I had plenty of time to steady myself and adjust settings until I was relatively content with some of my shots. 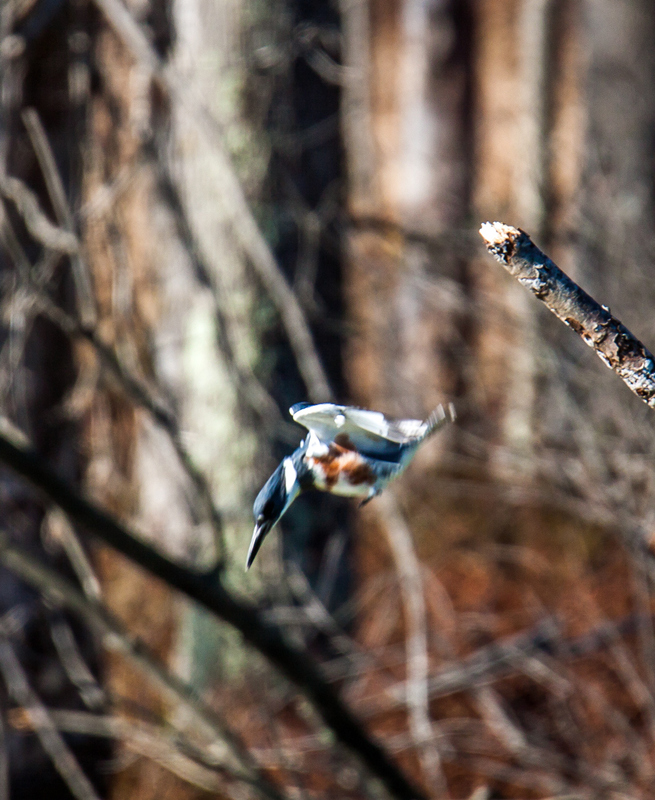 What I really wanted to do, though, was to capture the kingfisher. 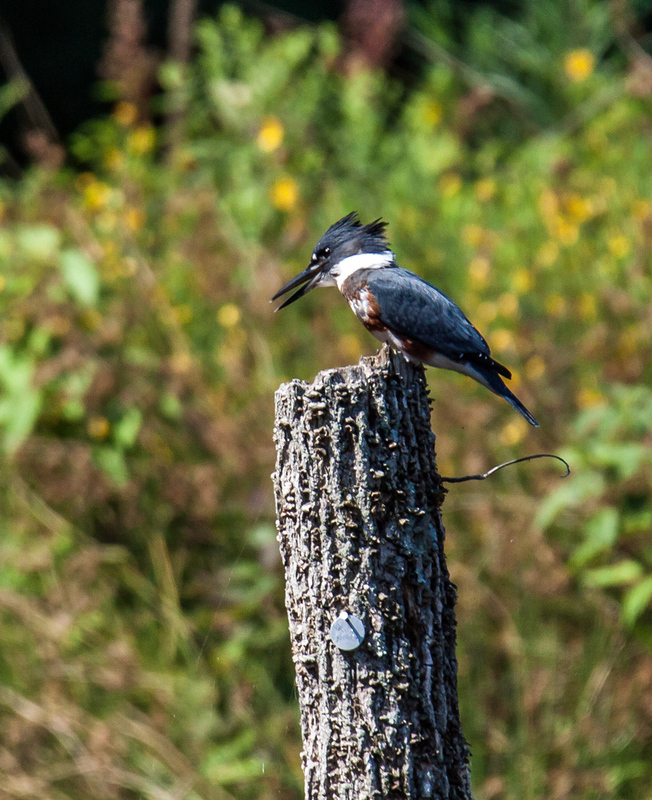 I knew that eventually the kingfisher would dive into the water and I waited. 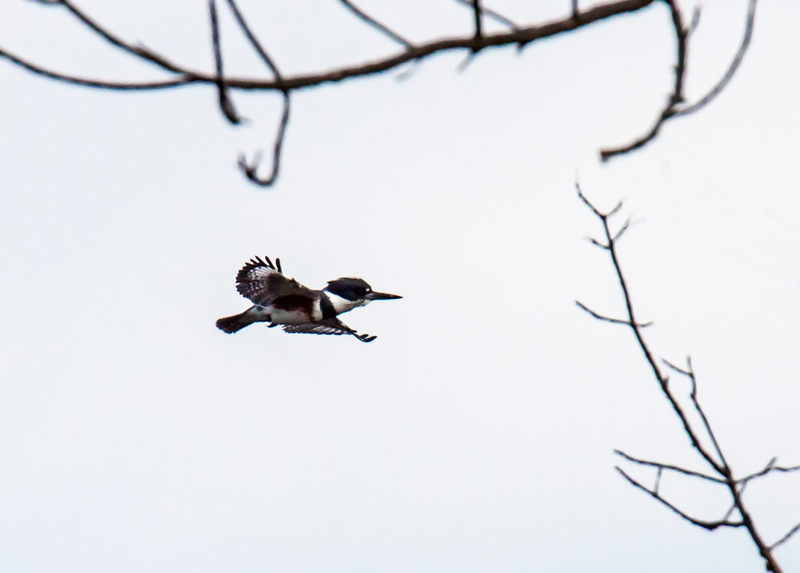 Kingfishers don’t give any real warning when they are ready to dive, so I tried to remain alert and ready, even though I knew the chances of me capturing this fast-moving bird in flight were slim. 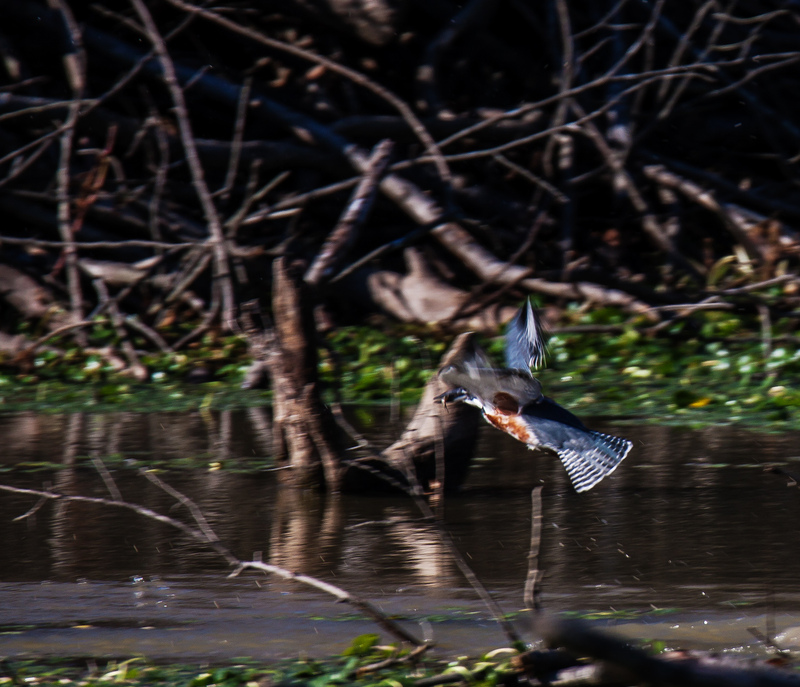 The kingfisher dove several times and I did manage to capture a few ok images of her flight toward the water. My favorite shot, however, is the final one here in which she is flying out of the water with what looks to be a small fish. It was a nice catch for both of us.